Livermore Casino’s December Deep Stack Tournament was one of their busiest Deep Stacks yet. 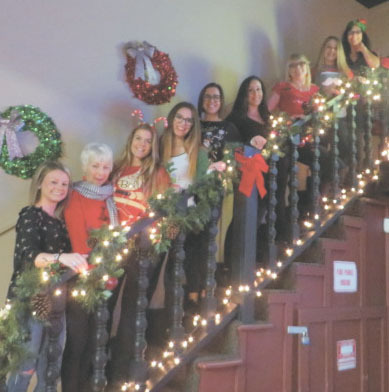 It was held on Dec. 16—the same day as their annual Employee Appreciation Christmas Party—and the first place winner took home over $3,700. After the tournament ended it was party time, including a fully hosted dinner buffet, DJ, dancing, and an amazing raffle for their employees. It was a great time for Livermore Casino to wish everyone a happy holiday season and joyful new year. Livermore Casino has 12 tournaments weekly, with buy-ins ranging from $45 to $120, all with $1,000 first place guarantees. (Note that any special event tournament will supersede regularly scheduled weekly tournaments.) Please check their tournament listing in the back pages of this issue or on their website at LivermoreCasino.net. For more details, contact tournament directors Nick or Danny at 925-447-1702 x205. Earn dDouble points in all of their Sunday 11 a.m. tournaments, their $120 buy-in Bounty Tournament, which is the last evening tournament of the month, and their monthly Deep Stack Tournament, which is on the third Saturday of the month. The buy-in for the Deep Stack is $175 with a start time of 10 a.m. (sign-ups at 9 a.m.). It has 20-minute rounds, 15,000 in starting chips, and a $2,000 first place guarantee. Livermore Casino’s cash game promotions include three daily High Hand Bonuses, Royal Flush and Aces Cracked, along with Bad Beat Jackpots in Omaha and Hold’em. Live action games include $3/200 spread-limit Hold’em, $4/8 limit Hold’em, $6/12 Omaha Hi-Lo with a $10/20 kill, and Pan. Their Cal Games include EZ Baccarat, Three-Card Poker, Pure 21 Blackjack—all with no collection—and Fortune Pai Gow. The kitchen at Livermore Casino delivers outstanding fare, including their Friday evening Prime Rib Dinner Special. Don’t forget to visit their Sports Bar, which has Happy Hour Monday through Friday from 5:00 to 7:00 p.m. All of this in Downtown Livermore—the Tri-Valley’s only Poker destination.